Torrente is like Spain's Bad Lieutenant except more lovable. We guess. This first and third person shooter is based on the hilarious Spanish comedy and can be played in two languages. Other than that, it's about what you'd expect. Some good one-liners, some shocking violence, and some 60 missions. There's nothing quite like the thrill of a good hand in a high-stakes game, or the feel of losing it all to some card-shark down the street. 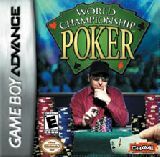 World Championship Poker gives you the chance to feel both while still on the go, letting players take on not only Poker games, but Blackjack, Slots, and more. If you're looking for a simple diversion that you can carry around with you, this might be the way to go.